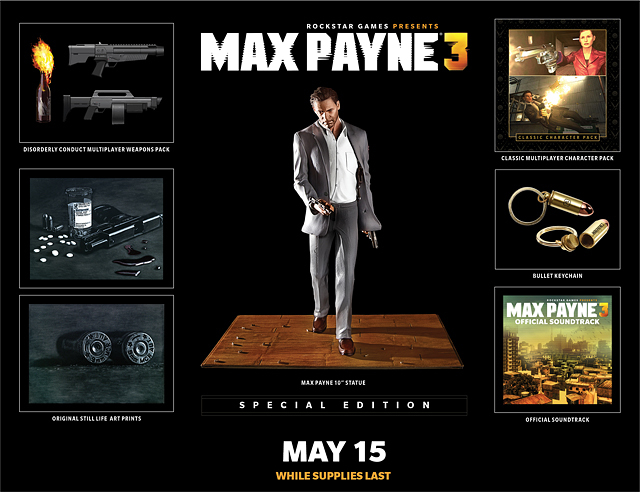 In light of some unfortunate recent retail issues in the UK and elsewhere in Europe which have affected preorder availability for the Max Payne 3 Special Edition, Rockstar Games have decided to extend the period to pre-order the Max Payne 3 Special Edition to continue all the way until game launch this May. Fans in the UK can order the Special Edition with local retailers as well as through the Rockstar Warehouse online. For everyone else in Europe and Australia, please check with your retailer of choice for details on pre-ordering (we will also have extended Special Edition pre-order availability for EU at the Rockstar Warehouse within the month).